Computers are alive and well at Coto de Caza, California, the training grounds of the Atari-sponsored U.S. Women's Volleyball Team which is now favored to capture the gold medal in this summer's Olympic Games in Los Angeles. Atari computers are used to decipher volleyball statistics in the office of the team's coach, Dr. Arie Selinger; down the hall, Dr. Gideon Ariel, the dean of modern sports science, takes advantage of computer power to study biomechanics, the science that links the physics of move-ment to human anatomy. Though biomechanical study existed before Dr. Ariel's arrival on the scene - it was painstakingly studied by means of slow motion film--it wasn't until Ariel discovered how to quantify such information with the computer that biomechanics blossomed. The task wasn't an easy one; it took more than 10,000 hours of programming time to develop the essential software for the field. But now, Dr. Ariel can study any movement, no matter how minute, and can reproduce it on his video screen as a three-dimensional graphic image. Any sport can be quantified. After all, "Movement is movement," Ariel notes, maintaining that all movement obeys the Iaws of Newton's universe. The secret of Ariel's procedure (and the missing element for a long time in biomechanics) is the digitizer, a screen lined on two sides by 20,000 tiny directional microphones. Any coordinate on the screen that is touched by a special magnetic pen is immediately recorded by the computer. To be digitized, a movement must first be photographed with high-speed cameras from a number of angles. Once these shots have been developed, they're projected onto the digitizer screen; Dr. Ariel then traces the significant points of the motion with a magnetic pen. The computer then interprets these impulses and projects the data to a video display as a three-dimensional graphic image of the movement. The end result is a fascinating method by which movement can be analyzed and studied. Such data as speed, force, and displacement are instantly available. Whether it's studied in slow motion or in frozen multiple images (or as seen from the top, the side, or the front), a movement sequence can be taken apart like a toy airplane. It can be played and replayed, and run backwards, forwards or in freeze-frames. Hypothetical variables can be substituted for real ones. What if, you want to know, the ball were hit this hard, at this angle, and in this direction? Results are immediately available. 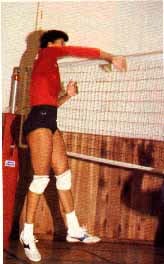 Flo Hyman, a member of the U.S. Women's Volleyball Team, is considered to be one of the finest spikers in the world. After a few sessions with Dr. Ariel, she discovered that she was hitting the hall too late on her spikes -- one inch into her downward motion. This caused her to hit the ball when she wasn't fully extended, which resulted in a loss of velocity. By correcting this, she was able to increase the speed on her spike. Dr. Arial also uses biomechanics to study the movements of the U.S. team's opponents. He did this by photographing the top teams that compete against the U.S. in international competition - China, Japan, and the Soviet Union. After digitizing this data at the Coto Research Center, he discovered a number of interesting things. He demonstrated one of them for me by pressing a few keys on the computer; this entered the coordinates of an x-y axis, which in turn oriented the picture at the proper angle. Suddenly, an image of a net and several figures on each side of it appeared on the screen. "Here's Flo Hyman going to spike into the Chinese team", Ariel explains. A thick Israeli accent is still present, even after 19 years in the U.S. "The question is, where should she spike? You cannot simply spike at random." Dr. Ariel taps at the keyboard again, entering more data. The figures animate, and the stick figure of Flo Hyman rises up to meet the small, white image of the ball. Ariel freezes the picture. "Now look," he notes. "She hasn't even touched the ball and yet they [the Chinese team] have already committed." Sure enough, all of the Chinese figures have committed themselves in anticipation of the spike. "Since they always do the same thing," Ariel continues, "we can tell her to make sure that she always spikes to the point where the other team is the weakest. "This is how we're beating the Chinese, the Japanese, anybody in the world. Utilizing this kind of sophisticated statistical analysis. It's like playing poker with someone and knowing what cards they're holding." Soon after the U.S. began winning international tournaments, the rest of the world caught on; Arieal and his cameras were banned from international competitions. But not before Coach Selinger had the information he needed. As Selinger explains,"With the computer, you immediatly have all this data available. You know how high the ball is set, how much time was available, how fast the Chinese block moved, how fast the ball was moving. All the information is there." "I don't want to say that I help any athletes," Dr. Ariel notes with cautious modesty. "You can't say you help anybody. We provide the tools that help them excel. But the minute you start taking credit foe anything, you upset the coach...you upset everybody." Dr. Ariel has had plenty of interaction with coaches. He threw the shot-put for Israel in the 1960 and 1964 Olympics, and while studying for his Ph.D. in computer science at the University of Massachusetts (Amherst), he served as an assistant track coach. It was at that point that the idea of linking computers to sports came to him. "Why not combine Rocky with Star Wars?" Until then, Ariel had to laboriously trace every segment of a movement on paper, limb by limb, frame by frame. What he needed was a way to quantify this information. He found his answer while visiting Dartmouth's medical school: the digitizer screen. After making this breakthrough, he launched his first business, Computerized Biomechanical Analysis andq uickly landed a few major sporting contracts. These contracts gave him the money to delve deeper into biomechanical research, which , in turn, eventually resulted in an invitation by the U.S. Olympic Committee for him to become its director of research in Biomechanics. As the U.S. Woman's Volleyball Team enters the home stretch in its race toward a potential gold medal, Gideon Ariel can stand back and gain a good deal of satisfaction from his contributions of the team. As he so modestly maintains, "I don't want to say that I help any athlete. We simply provide the tools that allow them to excel." But those tools have revolutionized the way that these Olympic athletes look at their bodies in motion, an have provided them with a major boost in their attempt to scale the Olympian heights. Davin Barry is a technical writer in the computer field, and the author of a upcoming book on the word processing program Wordstar.